Spain’s Prime Minister Pedro Sanchez has called a general election for April 28 after his minority government’s budget proposal was rejected by lawmakers. The election is Spain’s third in less than four years, a symptom of an increasingly fragmented political landscape and a sign of how Catalonia will remain a thorny issue for the next leader. Spain's Prime Minister Pedro Sanchez is photographed at the Spanish parliament in Madrid, Feb. 13, 2019. ​How did Spain get here? The heightened fragmentation of Spain’s political scene led to an inconclusive election in 2015. When Spaniards went to the polls again months later, Mariano Rajoy, the incumbent prime minister from the PP, declared victory but wasn’t able to form a government until the 11th hour, when Ciudadanos backed him and the Socialists abstained in parliament. But his first weeks in office were plagued with missteps including a U-turn on his approach to migration, increasingly restricting access in line with other European nations. Some moves, like the exhumation of the late dictator Gen. Francisco Franco’s remains, played to his constituents but was met with eye-rolling by the right wing. Thousands of demonstrators hold Spanish flags during a protest in Madrid, Feb.10, 2019. 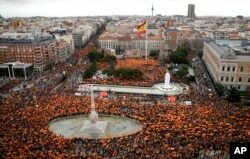 Thousands of Spaniards are joining a rally called by right-wing political parties to demand that Socialist Prime Minister Pedro Sanchez step down. Sanchez’s Socialists lead in the polls but not by enough to form a significant majority in parliament without the support of Podemos and the regional nationalist parties. 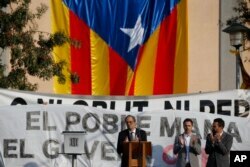 The prospect of Catalan nationalists joining could well be jeopardized by the trial of a dozen politicians and activists for their roles in the Catalan breakaway bid two years ago.